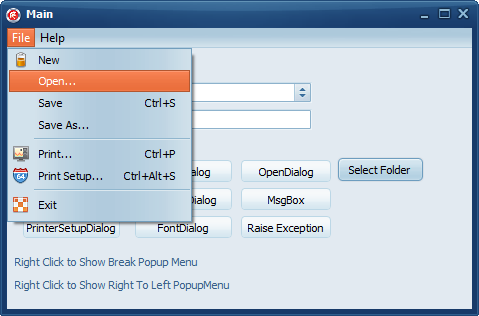 As you probably know the VCL Styles doesn’t support Popup menus, this means if you apply any VCL Style to your VCL Application the popup menus will remain with the Windows native look and feel (exists some workarounds for this like use a TPopupActionBar as described here, but this only works partially, and doesn’t support the child menus of a TMainMenu). 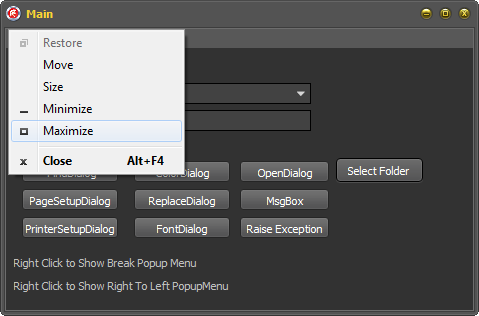 Since Sometime ago the VCL Styles Utils project can help you to overcome this limitation adding support for VCL Styled Popup Menus. Now we just uploaded a major update to the VCL Styles Utils project. This new version fix all the issues reported via mail and the issue page related the PopUp menus like support for the Break property, Checkboxes, Radio Items, Default items and so on. To add support for VCL Styled Popup Menus in your Application only you must add these units to your project Vcl.Styles.Utils.Menus, Vcl.Styles.Utils.SysStyleHook and Vcl.Styles.Utils.SysControls. You can download sample application from here and the source of the Application is here. Thanks for the feedback. You are right the issue only happens with the Metro Black Style. I just fixed the code. Try the sample demo again. Thank you for fixing one of my posted problems. I really appreciate it. Great work, almost perfect…but I’m asking always the same thing :-) . 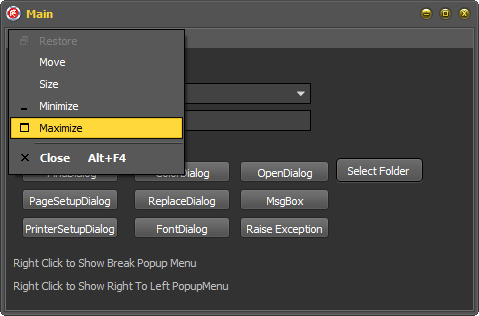 I need this, I’ve some applications with traditional TMainMenu running on monitors 1900×1200 and I need to show the menu a little bit bigger then classic 8 size and with the style that I want but I don’t want to oblige my customers to modify the Windows System Fonts. I want to be free to set TMainMenu font in Times New Roman 48! I tried also TMS components, the TActionMenuBar but everything is soffering the same bug. I opend a ticket in QC for XE3 but till now in XE5 they totally ignored this kind of bug. Really a shame! EMBA ist not able to fix their own Style features. Deliver half-baked features and let the customer alone! I am pissed! I agree with you. It is really a shame. It is absolutely not acceptable that this kind of problem should be resolved externally with hacks on the vcl. What are they waiting for? It is not acceptable that bugs are fixed only if they are voted in QC. A bug is a bug and should be fixed always. If I waste my time to open a ticket on QC preparing also demo to reproduce, it is because I need absolutely that fix and I aspect that this could be solved at least in the next release of the product. Why I’ve to pay a SA to get XE3, XE4, X5 which are pratically the same product speaking in terms of IDE and VCL develop environment? If you give me the possibility to do a thing, that thing should work; if not and you don’t want to fix it don’t give me the possibility of doing that thing! I apologize for the outburst! Why has EMB not fixed this long ago?? Why do their customers have to create workarounds. I certainly hope this fix makes it into the next update before XE6. 1. Can you please provide an example.dpr with all needed files? 2. A include file is missing. don’t remember the name. Hi Peter, How are you downloading the source of the sample application? are you using a subversion client? You get me wrong. okay. What files do I need for a complete skinning (innosetup is not needed)? It is not clear to me. 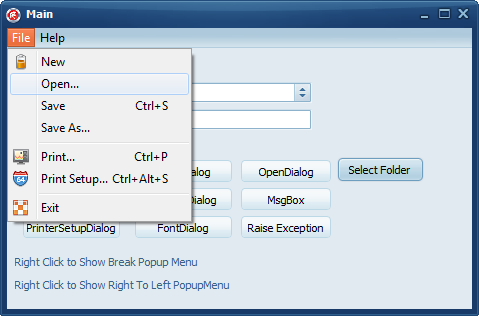 Peter, for add support for styled PopupMenus and common dialogs you must add all these units to your project Vcl.Styles.Utils.Menus, Vcl.Styles.Utils.Forms, Vcl.Styles.Utils.StdCtrls, Vcl.Styles.Utils.ComCtrls, Vcl.Styles.Utils.SysStyleHook, Vcl.Styles.Utils.ScreenTips, Vcl.Styles.Utils.SysControls. Thanks! What about the remaining: Utils, Colortabs, WebBrowser, ……? These units are optional and must be used depending of if you App uses the TWebBrowser or do you want change the TPageControl default style hook and so on. All this is detailed on the wiki pages of the project. Can you please report this using the issue page (http://code.google.com/p/vcl-styles-utils/issues/list) of the project and be sure to use the last revision of the project. Alt + Space is not working. Graphics, Menus, SysControls, SysStyleHook, SystemMenu and UxTheme are added to my project. Did I miss something? Please report this using the issue page of the project, providing a sample code to reproduce. I added the designated units to fix popup menus but menu item shortcuts are still not being displayed.